Hillview is a small estate of mixed properties, some built privately and the remainder were built by the local authority. The estate was built sometime after 1958 on the site of a second world war (1939 - 1945) prisoner of war camp. At present we know very little about the POW camp and are willing to learn more. If you know anything about it or have any photographs, can you please contact us and tell us what you know. Perry Lane is an estate of corporation houses built in the post-war period. They are located in a commanding position looking towards the Ouse Valley and Newport Pagnell. Although these properties were built by the local authority, many are now in private ownership. The Sports Field is home of the village's Football and Cricket teams. The field is on a permanent lease to the village and maintained by one of the village land owners. The Sports Pavilion was paid for by fundraising events and built mostly by local labour, over a five year period. It is now maintained and operated by Sherington Parish Council. 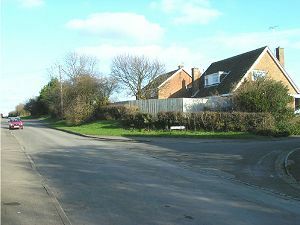 The lane continues on over the bypass to Gowles Farm situated in the far north east corner of the parish.